Swallows migrate from South Africa and arrive on our shores in mid-march and leave in September. They are often associated with the fact that summer is on its way. These small and aerodynamic birds are prolific hunters, feeding on insects which they catch in mid-flight. Swallows traditionally built their nests in barns, under bridges or along overhanging cliffs but over the last few decades they have more commonly favoured buildings. Nests are very easy to identify and are distinctive to the swallow/swift family, building their nests from clay or mud in a quarter sphere shape. 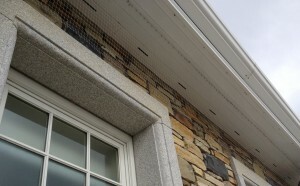 Areas that are favoured by swallows to build their nests are located at eaves of houses between the wall and soffit. Swallows return to the same location to nest every year so the number of birds nesting in one area can grow year on year. Although swallows are adored by many and are an important part of our ecosystem when they build their nests on the sides of houses, over doorways, along girders in factories, office buildings and in loading bays they can cause damage. Their droppings can stain surface finishes and paint work due to the high levels of uric acid in their droppings, not to mention the obvious health and safety implications associated with bird faeces. A build-up of these droppings could be a trip/slip hazard. Cleaning and yearly maintenance costs to remove nests, power washing and the repainting of walls (once the birds have started the migratory process) can be very expensive and time consuming. Bird proofing in the form of bird netting is the most successful way stop swallows nesting on your property. This tried and tested method consists of installing a discreet translucent net to a stainless steel wire frame at a 45degree angle between the wall and soffit stopping the swallows from building their nests. Swallows nests, eggs and chicks are protected under the Wildlife Act 1976 and Wildlife (Amendment) Act 2000 and European-level legislation. The penalties for tampering with swallows or disturbing their active nests consists of heavy fines and even imprisonment. So any bird proofing work that needs to be carried can only be done during the migratory process. ie. between the months of September to mid-March. Furthermore nest removal can also only be carried out once the birds and fledglings have vacated the nests. 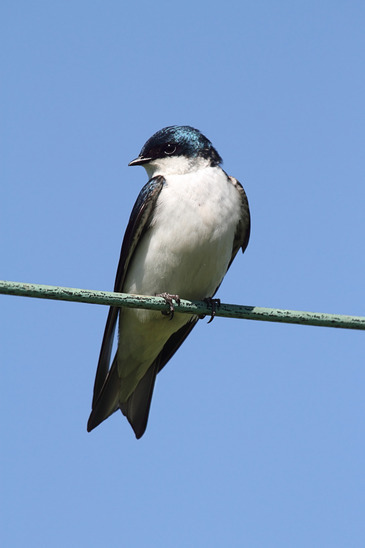 Wildlife Management Services have been providing swallow control for the last 10 years and are experts in the field. Please contact us at 087 6410206, 057 8623042 with your swallow problem.